This statistic shows the last time respondents to a consumer survey downloaded a mobile phone food application in Great Britain. 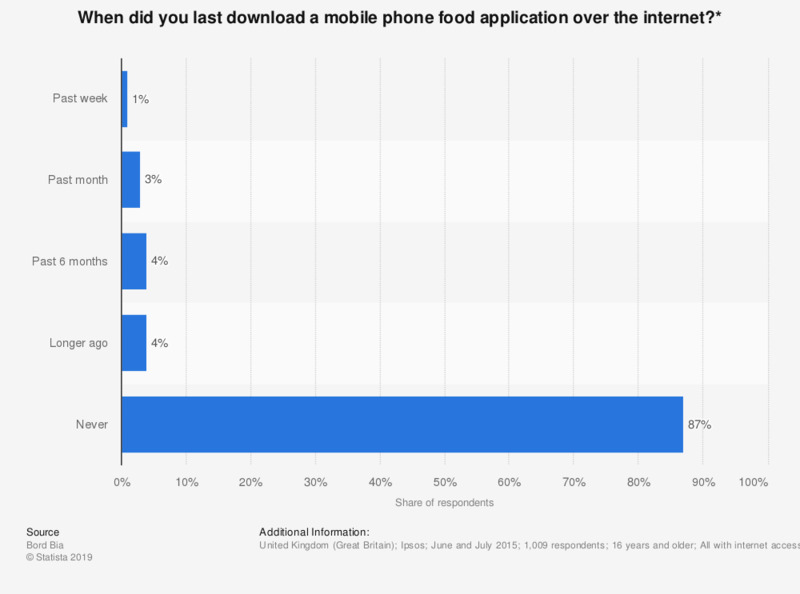 According to the survey conducted for Bord Bia Irish Food Board in 2015, 87 percent of respondents have never downloaded a mobile phone food application. Of those who had downloaded a food app, 3 percent had done so in the past month and 1 percent in the past week. * Respondents were asked "in terms of the statements on this card, when did you last do any of the following over the internet? - Download a mobile phone food application"
Have you ever downloaded an app onto a personal mobile device (e.g. smartphones, tablets)? In a typical month, how many mobile applications do you download on average?